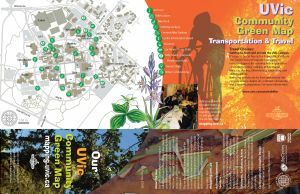 The first version of a paper Green Map for UVic has been printed (click thumbnails above above for larger images), and with that the first phase of the UVic community mapping project is complete. We are now actively looking for ways to get students, staff and faculty to use the mapping system in new and innovative ways. If you have an idea, contact us! Here are some high-lights of Phase I of the project: we hosted mapping tables at 5 events (Small Footprint Winter Market, Student Leadership Forum, Diversity Forum, Uni Centre Mapping Day and Green Drinks UVic), held 3 design meetings, made presentations to 5 UVic groups (Campus Planning Committee, UVic Health Services, UVic Communications Council, UVic Executive, and UVic Bicycle Users Committee), and had an un-official launch of the map during CUExpo when Wendy Brawer of the Green Map System was in town! Here are the latest website statistics: From 1 January 2008 - 13 May 2008 our mapping website has logged 1,572 unique visitors viewing 7,184 pages. Over 50 volunteer mappers (and growing!) have mapped 500+ points (click Web Map above to see for yourself). We plan to have an official launch of the map in June 2008.